It is a toothpaste for daily oral hygiene, with a new formula offering total protection and whitening, brightening and repairing action. A complete formula with non-nano hydroxyapatite, polyvinylpyrrolidone (PVP), spherical silica particles, fluoride and betaine. It cleans and whitens the enamel and protects it from tartar, cavities, tooth sensitivity and the passage of time, while also hydrating and protecting the mucous membranes and gums. You want the best quality products to care for your mouth. You want to care for, protect and whiten your teeth effectively and in a way that has been proven by professionals. Quieres cuidar, proteger y blanquear tus dientes de manera eficaz, y demostrada por profesionales. You have sensitive teeth or minor gum problems, but you don’t want to give up on a bright white smile. The low-abrasion spherical silica particles polish and whiten the enamel without damaging it. Finally, PVP prevents and eliminate stains. It forms a protective layer over the dentine, preventing the adherence of substances that cause the enamel to stain, as well as bacterial plaque. 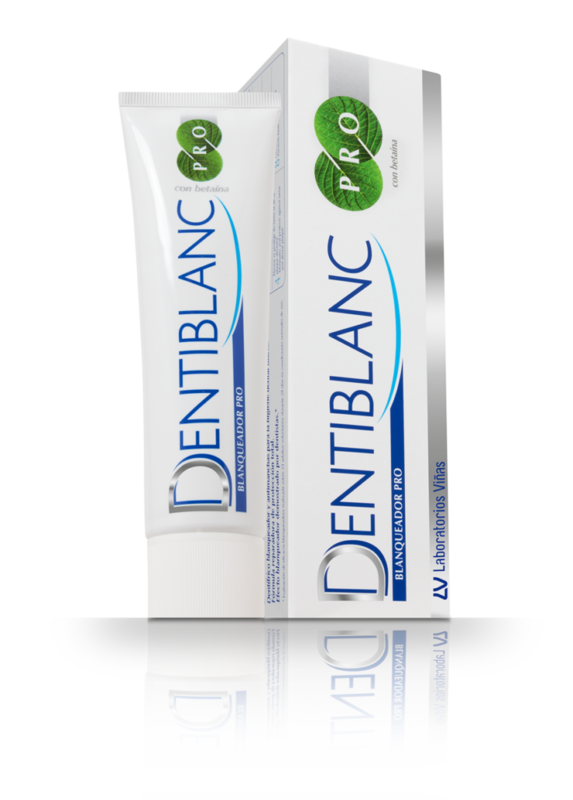 Dentiblanc PRO Whitening Toothpaste contains fluoride and betaine. Fluoride remineralises the enamel, preventing the gradual loss of minerals that occurs over time. Betaine hydrates the mucous membranes and maintains the water balance of the oral cavity, as well as protecting the mouth from possible acids that attack the enamel and cause bad breath. Betaine also reduces the irritating effect of other components. Continued daily use of Dentiblanc PRO Whitening Toothpaste guarantees excellent results, cleaning, brightening and whitening the teeth. Brush your teeth three times a day, preferably after meals and especially before bedtime. Combine it with Dentiblanc Whitening Mouthwash or Dentiblanc Extrafresh Mouthwash for complete oral hygiene.